Readers of this site probably know that, when I write about composer George Antheil, I find it hard to resist making two observations. The first is that he used the title of his autobiography to proclaim himself the “bad boy” of music; and the second is that he collaborated with Hollywood film star Hedy Lamarr to write a patent application that was approved for filing. Lamarr’s contribution had to do with an approach to encryption known as frequency-hopping; and Antheil demonstrated how it could be implemented by synchronizing devices reading punched paper tape. We know the source of Antheil’s contribution. He had already composed music to accompany the silent film “Ballet Méchanique;” and his instrumentation required (among many other things) sixteen synchronized player pianos. What about Lamarr? 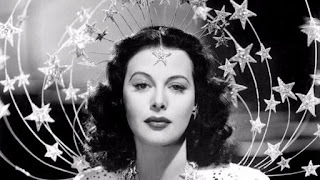 Alexandra Dean’s film BOMBSHELL: The Hedy Lamarr Story has much to say about the significance of frequency-hopping and the critical role it plays in implementing the “mass connectivity” that is now so predominant in the world as we now know it. However, there apparently was not much of a documentary record available to Dean when it came to trying to account for that “Aha!” experience that triggered her discovery. There are some interesting graphics that illustrate the idea itself, but the film never quite manages to situate that idea in a narrative context. The result is that the discovery itself ultimately gets buried under the far stronger narrative of Lamarr’s life story. Mind you, that story almost has a stranger-than-fiction quality about it; and much of it feels like a roller coaster ride with “Hollywood culture” as the roller coaster itself. The ups and downs of Lamarr’s life run to such extremes that the viewer is left dazzled by the fact that a woman who escaped Adolf Hitler was never quite as successful with Louis B. Mayer. Perhaps Lamarr and Antheil were so successful as intellectual partners because they both knew how to march to the beat of their own respective drummers. The difference is that, over a century after his birth, Antheil is still very much “on the sidelines” where concert programming is concerned. On the other hand, while Lamarr had to endure the slings and arrows of an outrageously inaccurate ghost-written “autobiography;” she at least made an impressive number of films that deserve to be remembered. The problem (at least for the few of us left with an interest in the history of technology or, for that matter, any other history) is that her success as an actress (and the decline she endured after her best films faded into the past) has almost entirely overshadowed her contributions as an inventor. Thus, while Dean claimed that she made BOMBSHELL because “there are so few role models for women in science and technology” (her words from an interview with her producer, Adam Haggiag), it is unclear what the film offers by way of a role model. BOMBSHELL was apparently made for the American Masters series on PBS. Sadly, too much of what passes for content on PBS these days has somewhat of a CliffsNotes feel to it; and just-so-stories that skim the surface do not always serve that well in providing role models. Back when I was a computer professional, I had several occasions to hear talks by Grace Hopper. Hopper was actively present in the creation of many of the fundamental building blocks of programming techniques and software artifacts. Furthermore, her skill as a speaker was so well-crafted that it was hard not to enjoy listening to her a second time, even if the words were almost entirely the same as they had been the first time. Her reputation was so formidable that the Association for Computing Machinery named one of its awards after her. It named another award after Alan Turing, who has now been portrayed by the likes of both Derek Jacobi and Benedict Cumberbatch. Watching Linda Hunt on television, I often think of how much of Hopper’s character lurks in her portrayal of Henrietta Lange. Hopper is decidedly a character worth considering as a role model! BOMBSHELL: The Hedy Lamarr Story will open this Friday, March 9, at the Clay Theatre at 2261 Fillmore Street, on the southwest corner of Clay Street. The first screening will be at 2:40 p.m. Dean will be present for a Q&A session with the audience following the 7 p.m. screening. Other screenings will be at 4:50 p.m. and 9:40 p.m.